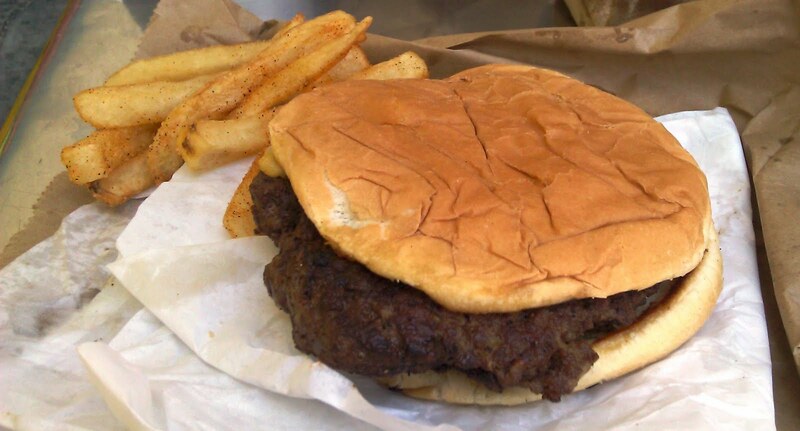 Fat Bruce Lee declared this to be burger week--one burger review/day. On this day, Master Burger had made its way to the top of the review candidates. We strapped on the jet packs, and we made our way to the Jefferson Park neighborhood to sample a burger, which had consistently been on top ten lists of LA burgers for several years. Master Burger was a classic, LA burger stand: it was cash only at a walk-up window; wait for your number to be called; get your bag of food from a separate window; consume burgers at a small selection of outdoor tables. Master Burger also served hot wings, steak sandwiches, and a variety of Mexican dishes. We arrived just before noon, so we narrowly avoided getting bogged down in the crowd that gathered shortly after the 12 o'clock mark. Even so, our orders took about 20 minutes to prepare. We ordered two Master Burger combos with cheese. That came out to $11.00 for two 1/2 pound cheeseburgers, two orders of fries, and two soft drinks. $5.50 apiece for lunch was a great price. The Beef: This was 80:20 Chuck. The beef was flavorful and just moist enough. It was cooked through, so the beef flavors were well-developed. There was also a pleasant end-note of funk, which briefly lingered on the palate. A large portion of the fat rendered off during the cooking process, so these burgers were not greasy. The Seasoning: The seasoning was heavily applied to the burger patties while they were cooking. It was a peppery Lawry's seasoning salt-type blend. This was applied a little too generously, and the seasoning dominated the flavors. The Sear: The sear on the cheeseburgers at Master Burger was tremendous. It was dark, thick, crunchy, and flavorful without being charred. The sear was a real high point of this burger. The Preparation: The Chuck was hand-formed into thick, irregular patties and cooked to Well-Done on a very hot flat-top. The patties were formed with enough pressure to make them firm, but the burgers were not chewy. The Cheese: The thick slice of American cheese melted into crevices of the well-seared burger patty and completely fused the top bun to the burger. I found the burger salty enough that the cheese only provided a bit of texture. Others in my group found that the the cheese really came through--they must have had a little more cheese on their burgers or a little less salt. The Bun: The bun was lightly toasted. 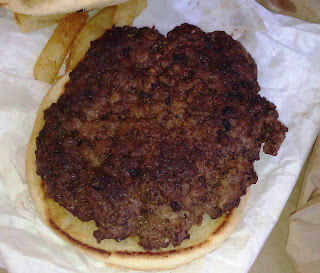 It was a squishy, moist, yeasty, unseeded, standard hamburger bun. The bun was completely adequate. The Fries: The fries were unexceptional. They arrived at Master Burger frozen in bags. These were peel-off, 1/4 square, stick fries. They were very average, and the were served in an oil stained, brown, paper bag. Seasoning... a shaker of seasoning salt was chained to the counter, so seasoning was poured in the bag, and then one shook the bag to evenly disperse the seasoning throughout the generous portion. The fries were not crisp. The Value: It was $5.50 for a tasty, one half pound burger with a gang of fries and a 16 ounce drink. The value was excellent. I liked the burger at Master Burger. In spite of it being over-seasoned, it was darn good. The sear was amazing and the value even more amazing. I had a 1/2 pound Chuck burger with so-so fries at Rustic Canyon a few night prior for 18 bucks. Master Burger served up a burger prepared with similar ingredients for less than a third of the price--parking was free--the beverage was included--the sear was amazing--and it was far less greasy at Master Burger. I finished my cheeseburger from Master Burger--I didn't plan on it, but I just didn't want to stop. I only ate half of the Rustic Canyon burger, and the excess fat still gave me a mild stomach ache. Oh, Master Burger also accepted food stamps, so the neighborhood was a little rougher than Rustic Canyon's Santa Monica location. Burger Review : A better than average burger sear with too much seasoning at a WAY better than average price at Master Burger. If they dialed back the seasoning, this would be better. Still, I would return for this burger.